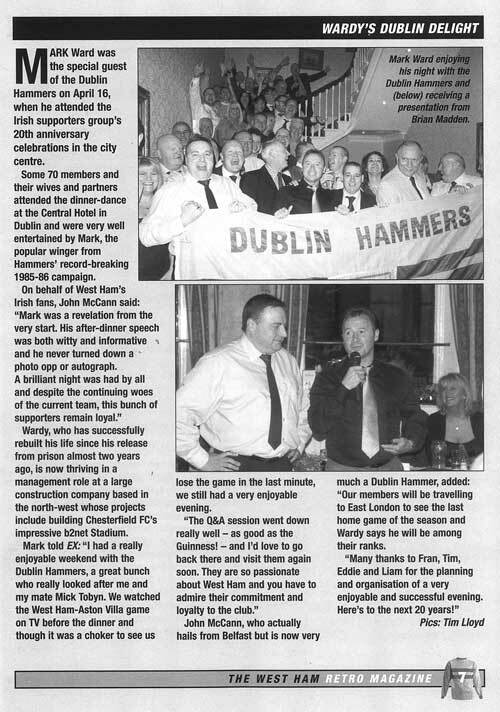 This article on the Dublin Hammers was published in the Club Programme for the match against Sunderland on Sunday 22nd May 2011. The West Ham line-up for the fixture included; Green, Spence, Bridge, Gabbidon, Jacobsen, Collison, Sears, Parker, Noble, Ba and Cole. (Left). Ex Hammers Magazine, a West Ham retro publication featured a full page article on the Dublin Hammers 20th Anniversary celebrations with special guest Mark Ward. (Right).